Synopsis: Homefront is an action movie about a widowed ex-DEA agent who retires to a small town for the sake of his 10-year-old daughter. The only problem is he picked the wrong town. Once upon a time Jason Statham had hair, and to prove this point he wears a great shoulder-length hairpiece at the beginning of Homefront while playing an undercover D.E.A. agent in a drug-running motorcycle club called the Outcasts. It is quite a fantastic thing to witness, while the rest of the movie is standard Statham fare with little left to the imagination as to how things are going to turn out. One thing is for sure, its a bloody mess of fighting, killing, and everything in-between before the credits roll. Phil Broker (Jason Statham) has retired from the D.E.A. after his undercover work with the Outcasts ended badly; the son of the leader was killed and Broker is a wanted man by the imprisoned father. 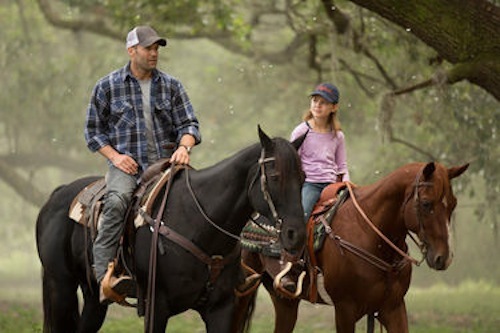 The best way to get away from it all is to move to a backwoods town in Louisiana with his daughter where they can lead a simple life in hiding, riding horses and fixing up their new home. The simple life could have panned out if it wasn’t for Broker’s daughter and her need to stick up for herself against the school bully. He wanted her hat, pushed her down to get it, and she took him down–she is the daughter of a Statham character, after all, so of course she can defend herself at the age of 9. The unfortunate mess of this playground fight is that the boy’s mother just happens to be a crazy junkie, played by Kate Bosworth a little too well, and she enlists the help of her brother Gator (James Franco) to settle the matter. Gator is not right in the head, completely, even if his character is continually given a two-sided approach. He is against hurting children, but has no problem terrorizing adults or setting them up to be beaten, if not killed. Blame it on his desire to be a successful drug kingpin, but Gator isn’t a guy you want on your bad side. Then again, Broker isn’t one to sit back and allow himself to be harassed, or his child. 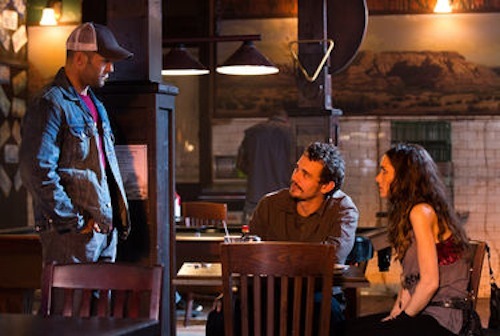 This begets Homefront‘s plotline, and from there it gets better–in the sense that it gets more outrageous and formulaic at the same time. Broker’s hiding place is found, and the Outcasts come calling for his head. But not before a viewer is treated to Winona Ryder playing a possible junkie, definite whore, whose morals are skewed, to put it mildly. Homefront is a centerpiece film for women to portray the ugliest of characters, and Bosworth and Ryder manage their parts extremely well. So well in fact that they outshine Statham and Franco on screen. There is something about watching two beautiful women turn themselves ugly and formidable that makes for great entertainment, even in a substandard film. The highlight of watching Homefront is the action and out-of-character performances by the entire cast, sans Statham–he is just fine being himself, even if he deserves better at this point in his career. Then there is the grand finale between Jason Statham and James Franco’s characters, which one must see to believe because no fantasy daydream could have come up with a more fulfilling moment in movie history. Homefront is not a terrible movie, it is quite a decent diversion. The fault merely lies in the fact that it does not test its audience; the plotline is laid out and obvious from the very beginning. This does not make for bad filmmaking, just nothing of note can be said beyond it being acceptable, and forgettable to most. Audiences have come to expect much of the same from a Jason Statham movie, and Homefront does not disappoint. There is the requisite head butting, the kicks, shoves, gun fights, impossible escapes from impossible situations, and so much more action to be had. One cannot forget of course the use of a very big gun in a very awesome scene by Statham that elicits cheers from viewers, as the movie continues to pummel and abuse its characters. Homefront manages to bring together Statham playing nice-guy-daddy and don’t-mess-with-me tough guy perfectly, smile and all. There isn’t a scene with Statham removing his shirt, something he has slowly been doing away with in his movies even as it was a staple of his early career. Nonetheless, he still has the moves to keep the action pumping throughout a movie and Homefront has plenty of action; bloody, messy, and oh-so painful looking action. The movie even features a fight between Jason Statham’s Broker and James Franco’s Gator–if that is not worth paying for, what is?